On behalf of the Nobles of Ahmed Temple #37, A.E.A.O.N.M.S., it is my distinct pleasure to welcome you to our website. As you navigate our website, I hope you find your visit informative. Chartered on August 22, 1956, Ahmed Temple #37 remains committed to making a positive impact and influencing change in the Oasis of Tallahassee, the Desert of Florida and the Domain. Dedicated to the vision of the Imperial Leadership, Ahmed Temple #37, the home of the Golden Fez Award, leads the Domain, with Charitable Donations exceeding $30,000 for the “National Diabetes Initiative” (NDI). 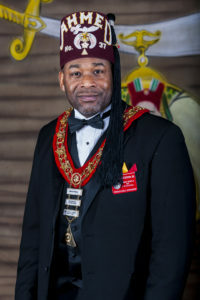 Also, the outstanding Nobles of Ahmed Temple #37 have unselfishly and consistently contributed to a multitude of charitable endeavors, resulting in a total of $3.5 million, in cash, non-cash and in-kind donations. The participation of our Nobles in the “Shriners As Mentors” (SAM) Program has made a difference in the lives of over 400 youth in the Oasis of Tallahassee and surrounding Communities. If you know of young men who are in need of positive role models, Ahmed Temple would appreciate the opportunity to mentor and assist in providing guidance and support for these young men. Finally, Ahmed Temple #37 continues to have significant impact on political and social change through its “Voter’s Education and Registration Program”, complimented with the designation of the Temples’ Grenadier Club as a voter registration branch, which provides a venue for citizens and patrons to register to vote. In closing, I have just given you a small sample of the wonderful things happening with Ahmed Temple #37. I invite you to enjoy the various links to obtain a full appreciation of Ahmed Temple #37 and our charitable endeavors.